As the media begins to go absolutely nuts over the idea that the President might declare an emergency and re-allocate military funds to build the wall, it would be useful to review all the sorts of authorities any President has in time of emergency. The radical statists who comprise the left are in favor of such power, but at the moment, such power, in the hands of President Trump, is contrary to their political interests. Their whole shtick is “resist.” Their rabid, anti-America base will oppose him simply because he’s not them. The NeverTrump republicans, including opportunists like Mitt Romney, will undoubtedly oppose him. Before the shrill voices grow louder, confounding our ability to understand the issue, let’s look at the law to see if we can easily surmise whether such an action by the President is authorized by the constitution. After all, the constitution must be our yardstick. With that in mind, let us examine why it is that President Trump is fully within the bounds of his constitutional authority to declare an emergency and build the wall, using the military to do so if need be. The bolded portion here is easily understood. He’s in charge of the military. He decides how and when federal troops and state militia[national guard] will be deployed. He, solely, is vested with the authority to determine their mission, and their day-to-day activities in pursuit of that mission. Not Congress. Not the courts. Not the Secretary of Defense(who works for him directly.) Nobody else trumps the President in the deployment of the armed forces. Nobody can countermand him in his role as Commander in Chief. Not John Roberts. Not Nancy Pelosi. Not Mitch McConnell. Got it? Seriously, if you have any doubt whatever about this, I have doubts about your reading comprehension. The President can, within his authority, bring all of the soldiers, sailors, airmen, and marines, be they active or reserve components, or National Guard components, and assign them the mission of building the wall. He can, within the scope of his authority, redirect EVERY MEMBER OF THE UNITED STATES ARMED FORCES, up to and including the Joint Chiefs of Staff, and also all DoD civilians, shovels and pick-axes in hand, to begin building the wall. He has this authority. Some will point out that this is all well and good – that the President has the manpower available – but he does not have the money for the materials. Wrong. Since the President determines the disposition of the Armed Forces, he also has some significant latitude in determining a number of things. He can, at any moment, instruct the SecDef to cancel a contract. Imagine all the whining Congress critters who have significant defense contracts in their districts who would lose their collective minds when he redirected funds in this manner. It’s within his authority. Also, he can call all active forces to support the Army Corps of Engineers, who he can command to direct the construction. There are all sorts of caches of “emergency funds” built into various budget areas that can be put to work in this way. Congress is powerless to stop it because they’ve already appropriated and authorized the funds. The President of the United States has broad powers already delegated to him by Congress to meet various emergencies. For instance, while I believe the War Powers Act is probably unconstitutional if any President wanted to challenge its limits, there is nothing to prohibit a president from feigning compliance. A president could very easily declare a national security emergency arising from our porous Southern border, and deploy our forces in support of that mission. At the very least, he’d have 60 days to make an initial report to Congress, and a further 30 days to withdraw forces(which means the limit is effectively 90 days, where US border operations would be concerned.) He need only be able to show that there is an attack of any sort on the United States. Did you happen to notice those Soros-funded idiots throwing rocks and Molotov cocktails and other weapons at our border agents recently? That’s an attack against the United States, folks. As readers are well aware, the United States of America has been at war since 2001. Due to this fact, the President’s general set of authorities are somewhat broader than they might otherwise be during peacetime. Folks, President Trump has so much power that he hasn’t even begun to exercise that he could build a wall from San Diego to Manhattan before the courts could untangle it all. The simple point is that the President has this authority. You may not like it. Hell, generally speaking, I don’t like it because it has been abused constantly to the detriment of the American people. Wilson and Roosevelt were monsters. They did so many things under “emergency doctrine” that still carry the weight and force of law that I shudder to consider it. If President Trump finally acts to build a wall along our Southern border, it will be one of the rare legitimate uses of such powers in my lifetime. Democrats and NeverTrump RINOs might hate it, but if President Trump pursues this course, he’s certainly got every manner of precedent to support him, and there is every conceivable loophole in existing law to support it. If he really wants to, nothing can stop President Trump from building that wall, except perhaps impeachment and removal, and while the Democrats may be able to carry out the first, there’s next to zero chance they can remove him in the Senate. The American people would revolt. Bank on it. This is an issue that should concern all those who are fervent conservatives, and it’s one we must now confront as we near the end of the primary season of 2016. In this election cycle, the predictable outcome seems more inevitable than ever, but one can’t ignore how the current GOP front-runner has at times scorned conservatism. Much like the long-established practice of the blue-blood Republicans, what has happened in this election is that conservatism has become increasingly isolated from the remainder of the Republican party, and from the electorate at large. This isn’t a pleasant reality for conservatives, but it is nevertheless true. So long as we permit this to occur, we will never see the sort of electoral outcomes we would prefer, never mind the the realization of substantive policy results for which we’ve been fierce advocates. We have some terrible choices before us, but in advance of us making them, we must come to understand how we’ve arrived in our current predicament. If we’re ever to return this nation to a constitutional path, we must do first by adhering to it ourselves, and we must be willing to accept our own role in our political misfortunes. The truth is somewhat difficult to accept, but there it lies, nevertheless, awaiting the summoning our courage to confront it. Conservatism is increasingly marginalized precisely because we have permitted its dilution and diminution through the acceptance of too many compromises of principles, and too many instances in which we were willing to form an ideological “big tent.” There’s nothing wrong with building temporary alliances with others, but if conservatism doesn’t stake out its ideological limits, and defend its ideological boundaries, it will continue to be marginalized within the broader general electorate. When George W. Bush ran for the office of President of the United States in 2000, not a few Texans had significant concerns. Many who had observed his performance here in Texas took the time to try to warn the party at large that he was not really a conservative. Bush tried to ply conservatives with a new formulation, calling himself a “compassionate conservative.” There were a few problems with this that some of us at the time recognized, and one of them was in the implicit denigration of conservatism generally: Conservatism is compassionate. We need no such adjectives. We need no such descriptors. We need no such modifiers on what conservatism offers to its adherents. Conservatism is the most compassionate ideology in existence, but by accepting the adjective offered by George W. Bush, we made what was tantamount to an admission that conservatism wasn’t inherently compassionate. What conservatives across the nation soon discovered was the fact that “compassionate conservatism” meant “big-government Republican.” On issue after issue, from defense, to security, to education, to Medicare, or bank bail-outs, there was no issue in which the answer of George W. Bush would be anything other than the expansion of government and the increase of our national debt at the expense of generations as yet unborn. It is true that Obama has essentially doubled the national debt, but we must in all honesty admit that the same can be said of George W. Bush. The Bush “compassion” came at the expense of conservatism, and at the expense of our generations of Americans as yet unborn. Nevertheless, we permitted Bush to fly the flag of a highly adulterated “conservatism” without respect to what the long-run affects on our movement would be. Most of the conservative media spent much of the eight years of the Bush presidency, and much time well beyond their end, defending the ludicrous policies and positions of a conservative who wasn’t. We’re seeing some of the same thing in the current election year. Donald Trump talks about “common-sense” conservatism. I have exactly as many problems with this adjective tacked as a prefix to conservatism as I did to the term “compassionate.” In fact, over time, there are or have been “Tea Party conservatives,” “reform conservatives,” “constitutional conservatives,” and “moderate conservatives,” but I think all these adjectives placed in series with “conservatism” simply dilute the meaning. These modifiers also act as a disguise for that which is not conservatism. Herein lies the problem for we conservatives, because I believe conservatism is inherently compassionate, wholly common-sense in its construction, and entirely committed to constitutional principles. In other words, to attach any prefix to “conservatism” is to dilute and pollute the concept, or strictly to permit the purveyor to pose as a conservative while not adhering to all or part of the broader concept of conservatism. The other effect of these bastardized versions of “conservatism” is that when people traveling under those phony banners continue to assert their hyphenated-conservatism, the natural result is that conservatism takes the blame for all the failures of those folk who are not conservative. For an example, consider again the “compassionate conservatism” of George W. Bush, this time in the context of the creation of the Transportation Security Administration(TSA,) and how he created a huge bureaucracy that increased the costs of government, but now, one-and-one-half decades later, we have another costly bureaucracy that fails to meet the security testing thrown at it just as badly or in many cases in worse fashion than the airlines-owned or airport-owned security that the TSA replaced. Again, another big-government solution that has failed, cost untold billions of dollars, and conservatives and conservatism are now permanently saddled with the blame, in large measure because a putative “conservative” enacted it. This is the problem with letting others define “conservatism,” or letting non-conservatives decide who is or who isn’t a conservative. “Conservatism” has become so generic and muddied at this point that it’s nearly impossible for us to in the first instance, exclude those who are not actual conservatives, and in the second instance, disclaim ownership of statist programs and policies enacted in the name of conservatism. This is a gargantuan problem we face, and it helps explain why Donald Trump can make the point that “conservatives haven’t accomplished anything,” or that “conservatives are part of the problem.” I think it’s time to heed the warning made explicit by this entire fiasco: We must make distinct our principles from the tawdry mix of self-contradictory, expediency-based lack of principle in the broader Republican party. Notice that neither had any requirement to the higher standard of “natural born citizen.” In point of fact, if you’re not satisfied that “natural born citizen” is a higher standard than the more ordinary “citizen,” this should make it crystal clear. Those who continue to insist that there is no difference between “citizen” and “natural born citizen” are either intentionally misleading their audience(s) or simply and unambiguously mistaken. In either case, this forms the basis of my first conclusion: The framers had intended a distinct and special standard for those who would hold the office of President under their new constitution. One might ask the reason, and I think the answer to that question lies in the contextual circumstances at that time. The United States was a new country, just a few years removed from having won its independence in a hard-fought and bloody war from the British Empire. 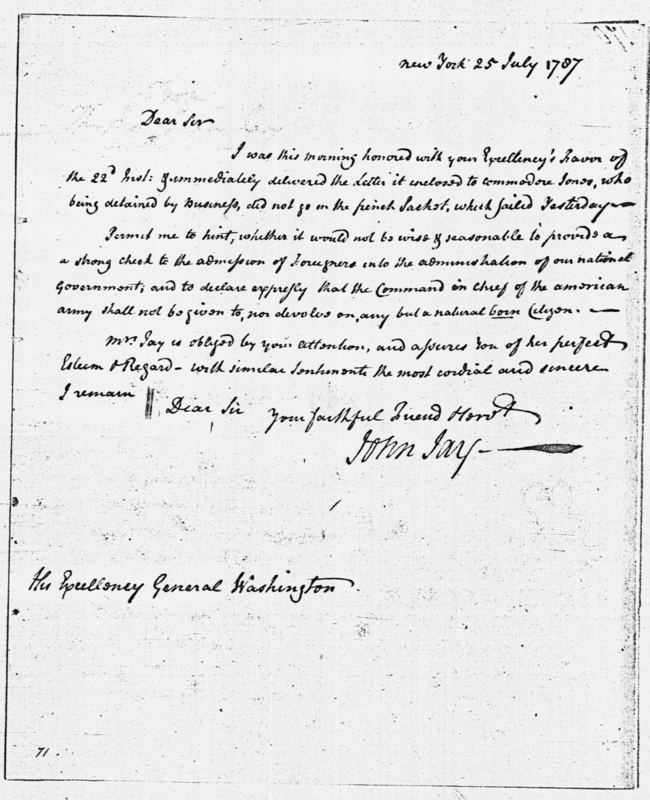 It began as a nation operating under the Articles of Confederation, but one of the impediments to the new nation, even while in its war with England, had been the weak power of the central government, and the lack of significant or workable taxing authority, and poor military governance by a Commander-in-Chief. It is well-known that these were among the chief ills of the Articles of Confederation that had set the framers on the journey of concieving a new system of government in the first instance. The great fear of the Constitution’s framers was that under the Articles of Confederation, the thirteen States might fracture from one another, each pursuing their own regional interests, making all of them more vulnerable to future aggression by the powers of Europe. This had been among the chief ills the Constitutional convention was convened to address, but at the same time, opponents of a more powerful central government, and particularly the creation of a more powerful Executive, came to express their reservations with this new constitution. Their fears have in some degree turned out to be merited over the long term, as we now see an out-of-control executive branch that has usurped many of the powers formally reserved to Congress. Be that as it may, this was the argument of the time, being the latter third of the 1780s, and it was an argument had in public. Many of the limitations upon the executive defined in Article II were in direct answer to the criticisms of the day. The public debate between the Federalists and Anti-Federalists came to be the battleground upon which the merits of these ideas were decided. I believe it is without question that which had established the great virtues of this undertaking, and that this was revolutionary in all human history is without doubt. 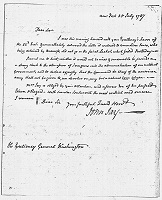 Whatever is a natural-born citizen, however it may be defined, what is certain is that John Jay considered this among the most critical requirements of the office, so much so, that he wrote Washington a letter on this subject as the toils in Philadelphia to conceive a new constitution were being undertaken. Still, the letter itself offers no clue as to the meaning of the term. We can presume that this term must have been a well-known concept to George Washington and probably the remainder of the framers, or even very well-known more broadly in the society, otherwise Jay would have been likely to state its definition here. This then leads us in pursuit of what the framers were referencing as they debated the new constitution, for in any such body, some form of standardized set of definitions is a necessity. This is, after all, the reason we have dictionaries, or set down laws in writing: We must have a common source as a key to understanding what is meant. Did the framers have such a reference? Yes, in fact they referenced many well-known philosophers, the common law, the Bible, and most particularly a volume that had been procured for such purposes by none other than Benjamin Franklin. The book is The Law of Nations, by Emerich de Vattel, published in 1758. In fact, it is reported that Washington, then presiding over the convention, died in 1799 having in his possession a number of long-overdue library books, and among them was this same The Law of Nations. I relate this anecdote about Washington and his long-overdue library book not because Washington had borrowed that book for the purposes of the convention, because he did not check these books out until after his inauguration as President under the new constitution, but that in seeking the counsel of reference material as the country’s new chief executive, he turned immediately to that with which he was apparently familiar, and had been among the references of choice for the framers during the the drafting of the Declaration of Independence, and in the new constitutional convention. The natives, or natural-born citizens, are those born in the country, of parents who are citizens. Anybody to whom this criteria would apply is long, long deceased. There are no persons alive for many years now who were “citizens of the United States at the time of the Adoption of this Constitution.” They’re all dead. Knowing this, to whom did this exception to the “Natural Born Citizen” requirement apply, and why was it included? The United States had not existed before the Articles of Confederation. Therefore, it would be impossible to elect a President who was a “Natural Born Citizen” of the United States at the time the Constitution was adopted. There were none. George Washington, our first President under the Constitution now in force, was not a “Natural Born Citizen” of the United States because the United States did not exist at the time of his birth. This exemption from or exception to the “Natural Born Citizen” clause was entirely because at the time of the adoption of this Constitution, no person met the criteria of “natural born citizen,” who could also have obtained the other qualifications. Anybody who was, at the time, a “Natural Born Citizen,” would have been a child, born at the earliest in the years that the Articles of Confederation were in force. Depending on where one draws the line for the existence of the United States of America, the oldest(and first) natural born citizens came into existence only after that date. Obviously then, the framers wanted the country to be able to elect a President for the first quarter-century of its existence, or their constitution would be useless. Again, this means that the second qualifier, the exception to “natural born citizen,” is no longer active, but it is still important, because explicit in that exception’s existence, we can see that there is most certainly a distinction between “natural born citizen” and the more ordinary “citizen.” What we can know for certain is that one can test this with the simplest logic: All red cars are cars. Not all cars are red cars. All Natural born citizens are citizens, but not all citizens are natural born citizens. This is a matter of rudimentary logic. We might also ask: “Why didn’t they define it?” The obvious answer to this question is the same as the answer to other instances when the framers failed to define terms, for instance, “the militia,” among many others: The terms in question had a commonly understood legal meaning at the time, and/or they shared a common reference, and they did not see the need to define what was already well understood and broadly accepted. It’s much like the meaning of the word “is.” That Bill Clinton raised the question as to the meaning of “is” merely tells you that he was trying to redefine the word to some meaning other than its well understood meaning. That’s preposterous, and it is the reason every person of discernment would(and did) dismiss Clinton as a charlatan the moment those words issued forth from his mouth. There are other definitions of “natural-born citizen” to be found, including at least one from feudal England, that some have claimed is the definition intended by the framers, but there is no evidence that they were necessarily aware of other definitions than Vattel’s, nor that they had the means to reference them. What is known is that they did have access to Vattel, and made extensive use of that reference. In point of fact, the US Supreme Court itself has referenced The Law of Nations in its own decisions, and the further into antiquity one moves through the court’s rulings, the more frequently one runs into Vattel. This can scarcely be accidental. Throughout the 1800s, we find Vattel’s The Law of Nations as a common reference, most particularly when issues in controversy revolve around international law, and matters related to sovereignty. This same claim, the need of only “a citizen parent,” appeared also in a paper on the Harvard Law Review website. Clearly, both the 1790 Act pictured above, along with Vattel’s The Law of Nations, both specify the children of “citizens,“not “a citizen” or “at least one citizen.” Both source documents specify “citizens.” It is this very specific construction, the plural form of the word “citizens,” that basically damns both the CNN and Harvard Law Review interpretations of the law, and it is scandalous that people writing for the Harvard Law Review would so easily miss this construction. People will derisively claim “oh, but this is just a technicality…” All the law is a technicality. It is all written with specific construction. That two people who have made a living at litigation on any level so easily dismiss the plural form of the word “citizens” is baffling to me, inasmuch as I had been willing to believe they were without agenda. In other words, it stretches the bounds of credulity insofar as I am concerned. Another of the sources often used when trying to determine the meaning of terms used by the framers is the Federalist or even anti-Federalist papers, written contemporaneously with the debate over a new constitution. One can learn the framers’ intent, broadly, and in some instances, the accepted meaning of terms at the time. Unfortunately, in this instance, these writings are silent on the meaning of natural born citizen, which is suggestive of the following: The term must have had a broadly-accepted meaning in the period during which the Constitution was framed and adopted. What we may learn is that the entire notion of the executive, the President, was under intense scrutiny, and concerns about the ultimate power to be wielded by the office-holder were many, various, and with many rational justifications, based on the recent experience with the King of England. We may also turn to the other source available to determine the matter: Case-law, a.k.a “precedents.” What have the courts ruled in the past? The closer in time we arrive in case-law to the adoption of the Constitution, the more closely the definition in precedents should resemble the framers’ intent. Though there seems to have been no direct rulings on the matter of presidential eligibility, there is at least one case in which the definition of that term is set down by the US Supreme Court. The most relevant passage in case-law one can find online is in the ruling in the 1875 case Minor v. Happersett. “The Constitution does not, in words, say who shall be natural-born citizens. Resort must be had elsewhere to ascertain that. At common-law, with the nomenclature of which the framers of the Constitution were familiar, it was never doubted that all children born in a country of parents who were its citizens became themselves, upon their birth, citizens also. These were natives, or natural-born citizens, as distinguished from aliens or foreigners.” Minor v. Happersett, 88 U.S. 162, 168. (emphasis mine) This is almost precisely the language of Vattel. It is important here to mention that the issue in controversy in Minor v. Happersett was not the definition of “natural born citizen,” or the eligibility of any person or persons to the office of President of the United States, however, it must be here also stated that this may be the closest we have in all case-law on the question of the definition of “natural born citizen.” Likewise, it is important to note that this decision had been the unanimous decision of the court, and therefore no dissenting opinion, or contravening definition of “natural-born citizen” is to be found associated with this case. There was no differing opinion joining the majority, since it was unanimous. In other words, the most venerated instance in which the United States Supreme Court references the definition of “natural-born citizen,” it appears to have been a broadly settled matter under the accepted common law, at least as of 1875. Some insist that this decision of the Supreme Court, having nothing to do with the eligibility of a candidate for President, ought not to be considered definitive on the issue because it was not the matter under examination. Others fervently disagree, including Leo Donofrio, an attorney who has pursued the eligibility of Barack Obama. I must therefore view the definition as cited in Minor v. Happersett, in fast agreement with the definition set forth by Vattel, as the best definition of the term I have available presently, barring the discovery of some other definition, elsewhere in common law or case-law. statute, or of course, a direct ruling on the matter of eligibility. Since I’m aware of no such ruling, I must rely on the definition I have, and since Congress has not, to my knowledge, defined “Natural-born citizen” elsewhere, apart from the statute of 1790 cited above(which is itsel in accord with Vattel,) nor subsequently amended such a definition, I have no choice but to assume this is the legally controlling definition. It is entirely possible that I have missed something, because no man can know or discover all things under the Sun, but I do know that the definition of the common form “citizen” was amended in the fourteenth amendment, but because it did not address the qualification of “Natural born citizen,” I see no use in belaboring the discussion here with something irrelevant. Also subsequently, Congress has acted to redefine what is a “citizen,” but again, I have been unable to discover any statutory definition, never mind re-definition of the term. For my purposes, and the purposes of my own considerations, I therefore accept Vattel’s definition as the one accepted and used by the framers of our constitution. Let us therefore fast-forward a few years, after he’s fulfilled his current term as Texas Land Commissioner, and perhaps served as Texas Governor, or maybe as a replacement to either John Cornyn or Ted Cruz as a United States Senator, after which we might guess that he will attempt to be the third President George Bush. Let us apply Vattel’s definition of “Natural born citizen to this politician. If we accept Vattel’s definition of Natural Born Citizen, and it’s fairly certain the framers did, parentage plays the key role in citizenship, particularly where the question of “native” or “natural born” citizen is concerned. In short, the facts are these: George P. Bush was born in 1976 to John Ellis and Columba Bush. At the time of his birth, Columba was not a citizen of the United States. The best date I’ve been able to discover for her eventual naturalization is in 1987, or 1988, fully a decade after George P.’s birth. This means, using Vattel’s definition, that George P. Bush cannot be eligible to the Office of President of the United States. One of the interesting features of a “natural born citizen” appears to be this: One is or isn’t a natural-born citizen. It is a construct entirely of heredity. Vattel’s definition requires that such a “natural-born citizen” be born to citizen parents, the plural form of the word, meaning both parents must be citizens. One cannot “become” a natural-born citizen in any manner other than by being born in accordance with the definition. It is entirely an attribute of one’s particular circumstances at birth. You either are, or are not. There is no way to gain that classification except by qualification at birth. 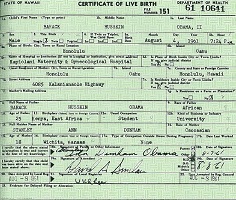 The short answer, all nonsense, political considerations, and fears of public ridicule as a “birther” notwithstanding, the short answer is: By Vattel’s definition, Barack Obama is not eligible to that office, and cannot be made eligible to that office without an act of Congress redefining “natural born citizen,” or a court ruling to some other effect. “Why then was he permitted to be seated as President?” Nobody with standing to bring a legal action has done so to date. There have been several actions filed by various parties in various courts, alleging various things about his eligibility, but to my knowledge, every one of them has been dismissed for lack of standing by the parties filing the action. “How does one obtain standing?” This is a matter well beyond the scope of this article, and one that would certainly require an expert understanding of law, so that I shall leave it to others to determine the answer to that question. I might note, however, that as recently as this past month, Donald J. Trump asserted that he has standing in the matter since he is presently a candidate for that office, as he threatened to file such a legal action against Senator Ted Cruz, and now seems to be suggesting the same for Senator Marco Rubio, two other candidates for the office of President. Whether his claim to standing is correct and accurate, I cannot say. On the surface, under the circumstances at the time, given the talking-points of the media and the Obama administration, it might well have seemed to most that Donald Trump was then vanquished on the matter: Obama was born in Hawaii. Full stop. Yet this may not be the end of the story at all, because what Trump did accomplish, perhaps shrewdly and knowingly, was the following: President Obama did publish his long-form birth certificate, a birth certificate that was authenticated by the office in Hawaii that is the authority of record in the matter, and that birth certificate, now authenticated and validated before the whole world, shows that President Obama’s father was a foreign national. In light of Vattel’s definition of the term “natural born citizen,” it is clear what this means for Obama’s legal eligibility to that office, so long as that definition holds. 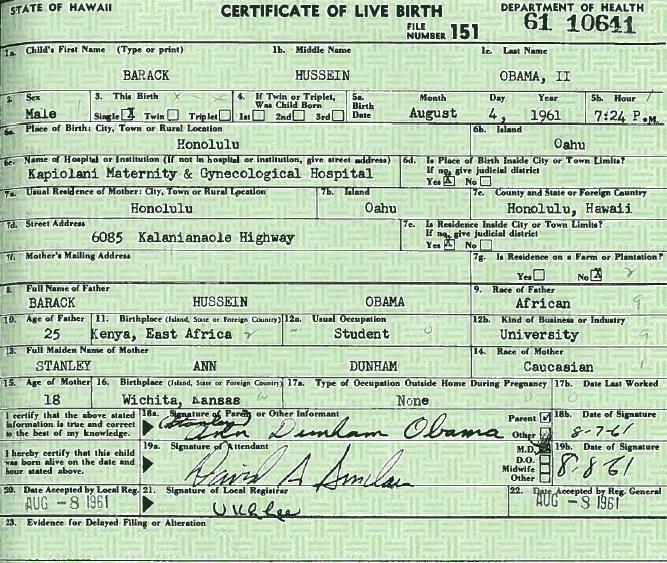 What Trump indeed accomplished was to goad the President into producing his birth certificate to prove he had been born in Hawaii. If Trump already understood the issue at hand, he may well have known that the place of one’s birth is far less important than the parentage, and now, Barack Obama’s parentage is firmly and irrevocably established. Donald Trump has been threatening a suit against Cruz on this matter, asserting his standing to sue on Friday, the 12th of February. It’s not the first time I’ve heard Trump threaten a suit in this matter, but it is the first time I’ve seen him specifically claim standing. Naturally, the matter of standing is the more difficult issue to get this eligibility question addressed by the courts, and again, I’m not a legal expert on the technical matter of standing, how it is established, and what all the arguments against standing might be. This then is all the more discouraging given the terrible news on the afternoon of Saturday, the 13th of February, when it was reported that Justice Scalia was found deceased in his room at a West Texas resort. If there was a justice who I would have most enjoyed to see examining this issue, it would have been Scalia. I would have anticipated his usual textual examination of the matter, whether in the majority, or writing in the dissent. I have no guess as to how he would have ruled, but if there had been a justice who was going to seriously examine the framers’ intent, it would have been Justice Scalia, More is the misfortune of the extreme untimeliness of his death from the point of view of somebody who wishes to finally have a court decide the matter of presidential eligibility. Imagining an outcome in accord with Vattel’s definition, it’s hard to conceive how they could long avoid the question of Obama’s ineligibility in accordance with that same ruling. There are those who will argue quite vehemently that all of this is nonsense, on behalf of one motive or another, but this then spawns another question in my mind: If Vattel’s definition is incorrect, why then have there been so many attempts in the last few decades to either amend the constitution directly in order to strike “natural born” from Article II, or to write statutes defining the term elsewhere in law. You can find an interesting discussion of that topic here. It is here that I must pause briefly to ask the question: “Why did the framers erect a higher bar for the office of President than for other offices?” The answer is plain: They believed that the holder of that office would have at his/her discretion so many broad and thorough powers that they feared a usurper of mixed or dual national loyalties might otherwise obtain the office and wreck their newly-constituted country. In other words, brought into the modern context, one might reasonably argue that “natural born citizen” was inserted into Article II’s presidential eligibility standard precisely to protect the nation from a person like Barack Obama, who appears to adhere to cultural, ethical, legal, and political standards most essentially foreign to the American nation. If this is not the sort of person against whom this clause was intended to protect the United States, I can conceive of no clearer historical example. Others have asked, variously: “Why didn’t the Republicans raise this issue in 2008?” Apart from the motive of cowardice in the face of prospective widespread ridicule as “birthers” at the hands of the comic class, or the cocktail party circuit in DC, the only other motive I can readily ascertain is that they may intend to submit for nomination a likewise ineligible person at some future time. I’ll leave it to your imagination to guess at who that may be. At long last, then, let me remind you once more that I am neither an attorney nor a judge, but merely a person out to answer an important question to my own satisfaction, and for my own purposes in consideration of future elections. I am not, nor do I here claim to be, a legal authority, and I offer no warranties that my opinions are infallible. I could have inadvertently missed a relevant source, missed some relevant ruling of the courts, or some act of Congress unknown and persistently hidden from my eyes during the course of my research. I have encountered mocking leftists, pushing and twisting and turning the law, the references to it, previous court cases, and all manner of thing in order to arrive at a conclusion favorable to their ends. I have encountered alleged “conservatives” who spend their time brow-beating the curious and inquisitive into submission, because “the subject has caused enough embarrassment.” I have even discovered people from as far away as Australia earnestly discussing the matter due to its global import. There are certainly many people who would like all of this to go away. There are also those so anxious to see only one outcome that they have taken shortcuts in their research, relying upon Internet rumor-mill answers, and so on, screeching about Kenyan birth conspiracies, and similar foolishness. It is certainly a curious and extremely mixed bag. Most of all, in your research, you will encounter many who are either entirely oblivious of any issue, or who upon learning of it, simply don’t care. In short, it’s a big Internet, and the extent to which one can revel in research is not quite, but nearly limitless. I am not here advocating on behalf of any person, candidate, or in any way do I expect this article to have any bearing on anything, except my own political choices. You are free to regard my conclusions in whatever light you wish, as will I. You are likewise free to embark upon a campaign of ridicule, and while I believe that’s silly, it’s your right, just as it is my right to express my opinion here. I am always open to new or more accurate information if it can be provided. I am ever open to new evidence, and I most certainly encourage you to embark upon your own research in this or any matter. My research will continue. To those among my friends who will be disappointed with my conclusions, or at least their publication here, let me merely suggest that I wished only to settle the matter for myself, and that the lengthy and difficult research went on a long while, in fact many months. This article has been revised, edited, and so on, as much as, or perhaps more than any article I’ve here presented, and while I’ve worried about where my research would ultimately lead, I’ve never had any doubt about whether I ought do it, wherever I might arrive. Editor: This has been a lengthy bit of research, running down leads and links, reading hundreds of articles, and looking at a number of photocopies published in various on-line libraries. Every person is entitled to his or her opinion, but I would encourage all readers to form their own opinions based on their own diligent research. The chances are high that this issue will remain unresolved unless and until the federal judiciary makes a ruling in the matter. In lieu of that, conservatives must be careful not to be led astray by some of the over-simplified discussions of this issue. Law is all about the “technicalities.” It’s our duty to jealously guard our constitution, all of it… I understand that I will be subjected to insult and ridicule by some who will wish to make this a matter of their desired outcome, one way or the other. I ask you to appeal to your own standard of judgment in the matter. I have no doubt but that there are powerful interests who would like this issue to remain obscured, so that until this matter, long over-ripe for definitive adjudication, is finally put to rest, we will be subject to much mischief.